A feud overtook the Jammu and Kashmir Ranji Cricket team in 1995. Kashmiri cricketers in the team then put up a rebel face. They boycotted the play. The immediate trigger behind it was the ‘discriminatory’ treatment given to them. That day, a middle order batsman from Basant Bagh Srinagar was leading from the front. And soon, he had to face the music for being a part of rebel group. Two decades after, Imtiyaz Hussain Jan, 40, remains any other local cricketer who keeps participating in the local tournaments. His love for the game hasn’t faded out. He still exhibits the boyish enthusiasm whenever he steps inside the ground. But the cricketer is still rueing the fact that he fell to politics in the team! Jan had an irresistible passion for the gentleman’s game since childhood. He was a cricket captain at National School in Srinagar’s Karan Nagar. It was during his stay at the school that his cricketing skills flourished along with his studies. At local levels, he continued to shine with the bat. But he was desperate to play at a big stage. In 1988, Jan, a Class 9th student was finally playing with big boys. That year he was selected in the renowned Srinagar Cricket Club. The club was affiliated and under a close watch of cricket selectors. Being the youngest member of the team, he held his nerves. And when it mattered most, he didn’t disappoint his team. He was steadily getting noticed. For the next five years, he kept performing with the bat. And then in 1993, Jan played for Islamia College in Srinagar. After that, he was seen in action at inter-university cricket tournaments. His performance was hailed by all. He soon got his place in J&K Ranji team. But the selection coincided with the situation in the valley, which was very tense. The time wasn’t conducive for cricket. Playing fields were giving ghost looks as situation forced many cricketers to stay indoors. And, frequent confrontation between militants and government forces had affected the mood in Ranji team—comprising of players of different parts of state with different ideologue. Soon, Kashmiri players felt the changed mood for them in the team. But they didn’t complain. By 1995, Kashmiri players started feeling the heat of ‘other’ treatment. Jan says that nmoods turned militant among Kashmiri players that year. The rebellion against ‘discrimination’ was on the cards. “Let’s boycott the play,” the Kashmiri players declared. As tempers soared, Jan had to wait for another two years for his debut in Ranji team. Jan claims a different yardstick was in force for evaluating performance of Kashmiri players in Ranji team. He calls it “one chance scheme”. One bad performance would earn a Kashmiri player a bench than a match! The treatment was getting on the nerves of Kashmiri player. This led them to again boycott the play. “But even protests couldn’t strike a chance in the attitude of selectors towards Kashmiris at that time,” says Jan, a post-graduate degree holder, who has scores of records under his belt. After 1997, he had to wait for the next five years to break into the Ranji playing eleven. It was 2002, and Jan was back into action against Madhya Pradesh. He secured 40 and 30 in two innings. But his comeback lasted for only a single match. It was a déjà vu for him. He had already met the same fate. After that, he didn’t earn any more chances. In spite of state’s apathy towards him, Jan hasn’t severed his ties with the game. He still plays at local level. He was seen in action in corporate leagues last year. He also played in one of the twelve teams of Downtown Cricket League in 2013. 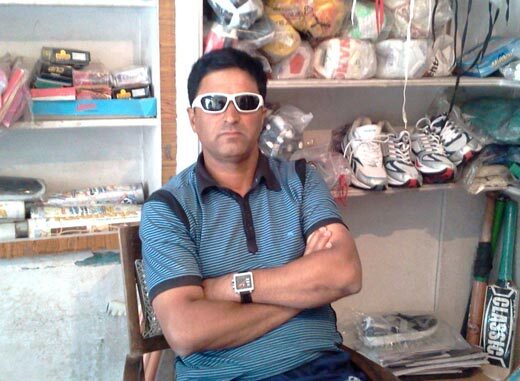 Presently, selling sports item at his shop in Srinagar’s Barbarshah, Jan was holding the same position as Sachin Tendulkar was holding in Indian Test squad! Both of them batted at number 4 in the Ranji team. But the fact remains: the same team turned him into a deadwood by curtailing his chances!